As a Purex Insider, I'm given numerous opportunities to test and sample a variety of great products. 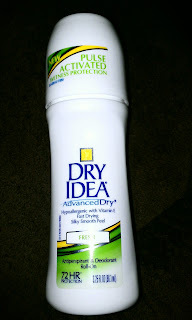 Most recently, I was selected to review the NEW Dry Idea Advanced Dry roll-on deodorant. I have been a solid deodorant user for as long as I can remember, always leary of roll-on deodorants. I was afraid that they would leave my under arms and my clothing wet and sticky. 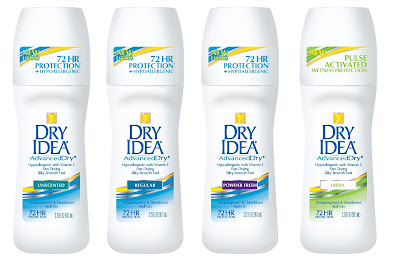 So, I will admit that I was a little nervous to try the Dry Idea roll-on deodorant - but did accept the challenge. I have to say that I was pleasantly surprised with my experience. It actually left my under arms silky smooth and dry! It seems strange that something wet could leave you dry... but it did. Dry Idea AdvancedDry is formulated with vitamin E leaving your skin extra silky and smooth. I received the fresh scent and it had a clean, subtle scent that was very nice - not too strong of overpowering, it was perfect. It also dried quickly which was one of my main concerns about using a roll-on deodorant. No worries now! The new Dry Idea AdvancedDry formula is available in roll-on (unscented, powder fresh, and regular), clear gel (unscented and powder fresh), and invisible solid ( unscented and powder fresh). Dry Idea women's deodorant and antiperspirant offer clinical strength protection for up to 72 hours that prevents and blocks body odor and excessive sweating. "Never Let Them See You Sweat!" This giveaway will end April 18th at Midnight EST. Disclaimer: I received complimentary women's roll-on deodorant from Dry Idea for the purpose of writing a review and hosting a giveaway. Regardless, I only recommend products or services I use personally and/or believe will be a good fit for my readers. The views and opinions expressed on this blog are purely my own. Results may vary. No monetary compensation was received. Powder Fresh Advanced Dry Idea Clear Gel. I would like to try the Powder Fresh Invisible Solid deodorant. I would use the invisible solid unscented, it would be great for me. I would most like to try the Powder Fresh Roll-On.